You may have never wanted to know much about significant monuments in Yugoslavia. Maybe that’s just not your cup of tea or perhaps you’ve never thought they could be interesting. Whether you’ve lived there or not, you probably know the former Yugoslavia was a magnificent country. It officially stopped existing as a whole in 1991, although certain variants existed until 2006. Today, only a few things still keep its memory alive: stories, architecture, art. 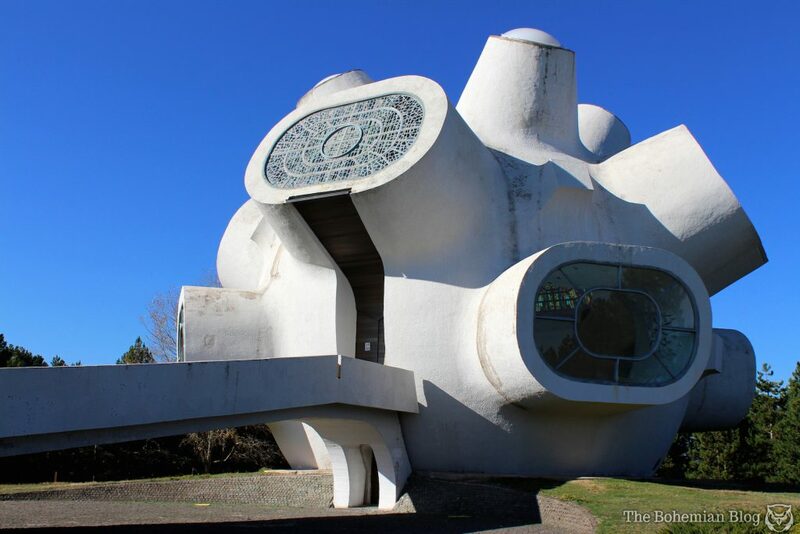 However, one of the ways to get to know the crucial, but tragic moments in Yugoslav history is through its monuments. It’s incredible that stone can carry so many emotions and meaning, and even be full of energy. 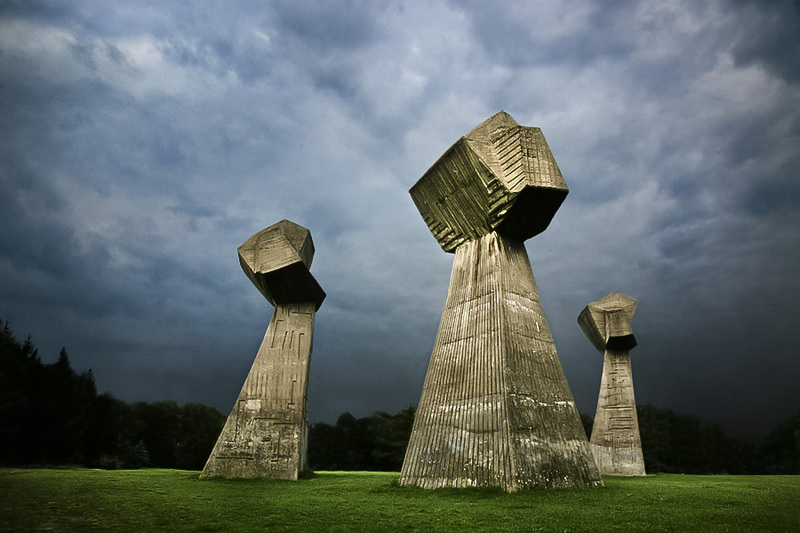 But Yugoslav monuments are a proof of the power of carefully thought-out art. Like in most European countries, World War II was one of the most difficult periods in the history of SFRY as well. Therefore, most monuments are dedicated to events and victims from that dark era. They’re either in places people often visit, such as parks, or in locations where a specific tragedy took place. Unfortunately, this makes some of them difficult to reach, since some are placed in forests or mountainous regions. 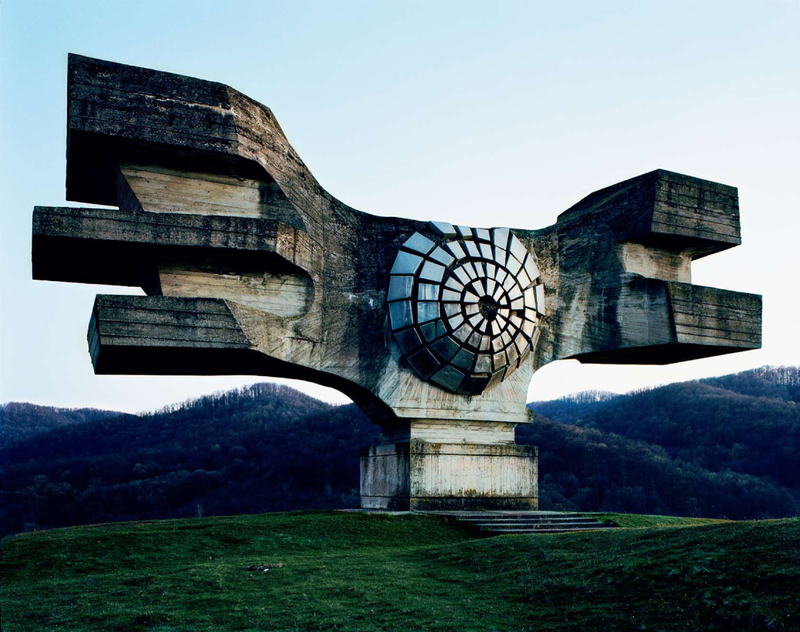 Most of the monuments are in accordance with the typical Yugoslav architecture – brutalist, simple and made of concrete. However, many have a strange, kind of futuristic vibe. At first, you might not know what those abstract sculptures represent. But when you hear the stories behind them, you’ll realize they’re perfectly complementary. It’s actually a mistake to call them Communist monuments. Even though that’s what they’re commonly called, since they’ve been built in the Communist era, there isn’t any political branding on the majority of them. Actually, even the ones dedicated to Yugoslav Partisans don’t have any Communist Party symbols on them, such as the five-pointed star. In Serbian, monuments are called spomeniks. We’re not mentioning this just as a fun fact or to teach you Serbian (but hey, don’t say no to free lessons!). Actually, you might hear that word used in the English language, when referring to Yugoslav monuments specifically. Next time you stumble upon an article about spomeniks, you’ll know exactly what it’s about. Without further ado, we’ve prepared a trip through Yugoslavia’s past with a list of its most fascinating monuments! This monument is dedicated to one of the most barbaric concentration camps in all of Europe. Actually, it became known as “the Auschwitz of the Balkans”. The Ustaše death camp in Croatia was brutal even for Nazi standards and measures. Its victims were mainly Serbs, followed by Roma and Jewish people. Today, instead of the gruesome camp, there is a gigantic stone sculpture that resembles a flower. The all-concrete grey monument represents darkness, but also rebirth. Its architect Bogdan Bogdanović had an idea of it symbolizing new beginnings and life in the ruins of a death camp. Along with a memorial museum, this is a place of remembrance, but through hope for better times. In case you’re not familiar with it, Crveni Krst was a concentration camp in Niš, Serbia. It was an extermination camp, and like many of them, it had an execution site. In this camp, that site was Mount Bubanj. During a relatively short period of time, more than 10,000 Serbian citizens lost their lives here. In the spot where Nazi victims were shot, three concrete statues rose from the ground. You might not notice it at first, but the statues are actually clenched fists pointing at the sky. They symbolize the men, women and children who went thorugh Nazi torture and died in that exact spot. Near the small town of Podgarić in Croatia, this monumental giant dominates a grass field. It’s made of concrete and aluminum sheets placed in the middle. Interestingly, some see it as a sun symbol, some as an eye, but all agree on one thing. Its purpose is to break the monotony and darkness and give life to the spomenik. Here’s the story behind the monument. During the Second World War, a Nazi puppet-state called the Independent State of Croatia existed. Its oppressive military force called the Ustaše wanted to ethnically cleanse the Croatian state. Therefore, ethnic-Serbs, Jews, Roma and Croatian rebels were the main victims of the Ustaše regime. The people of the Moslavina region organized a rebellion, an uprising of sorts. What’s interesting is that this was actually the first armed resistance movement during WW2. This region and Podgarić specifically were the core of oppression in an otherwise Nazi state. The spomenik itself is symbolically impressive. According to the designer, Dušan Džamonja, it’s supposed to represent ‘wings of victory’ overcoming death. Also, many have compared it to the ancient symbol of the ‘winged sun’, used to communicate power and holiness. Nevertheless, however you decide to interpret it, there’s no denying it carries a strong message. If you’re a sucker for events that inspired poetry and art, this is the place you should visit. One of the most famous Serbian poets, Desanka Maksimović, left behind a poem that depicts what happened in this exact spot. This memorial sculpture, also called ‘Interrupted flight’, was inspired by one of the most tragic events in WW2 Yugoslavia. Namely, shortly after the war started, German forces had a rule they followed for quite some time. They would kill 100 people for every German soldier killed. On October 21st, 1941, a series of executions were carried out, leaving roughly 2,300 victims behind. Sadly, around 300 of them were school boys, killed along with their teachers. When it comes to remembering the victims, the proposal of Smiljan Klaić and his partners Mihajlo Mitrović and Radivoje Tomić won the competition. Even though there are multiple sculptures in the memorial park, the most prominent one is ‘Interrupted flight’. The large concrete spomenik is v-shaped, but if you look carefully, it resembles a delicate white bird. You might not notice, but there’s a crack in its left wing. That symbolizes the early ending of young lives. A special touch that adds an emotional dimension is that on the faces of the sculpture you can see impressions of children. Now, this one’s appearance is completely futuristic and abstract. The spaceship-looking monument called Makedonium is a symbol of Macedonian freedom and independence. It’s really strange to think that it was built over 40 years ago (in 1974), since it’s bizarre even for today’s standards. The monument commemorates the Ilinden Uprising as well as the local Kruševo fighters who fought with the Partisans for Macedonian liberation. The first event occurred at the beginning of the 20th century and it aided the downfall of Ottoman occupation on the Balkan Peninsula. The second, however, was a part of the Yugoslav struggle against the Axis powers in the 1940s. The spomenik is stunning from the inside as well. It’s just as minimalist and brightly white, with pops of color provided by the stained glass windows. The way the building itself was constructed is symbolic and meaningful. For example, the entrance is shaped like the ‘M’ in ‘Macedonia’. Make sure to visit this one, since it’s famous worldwide for its unusual exterior and architecture. 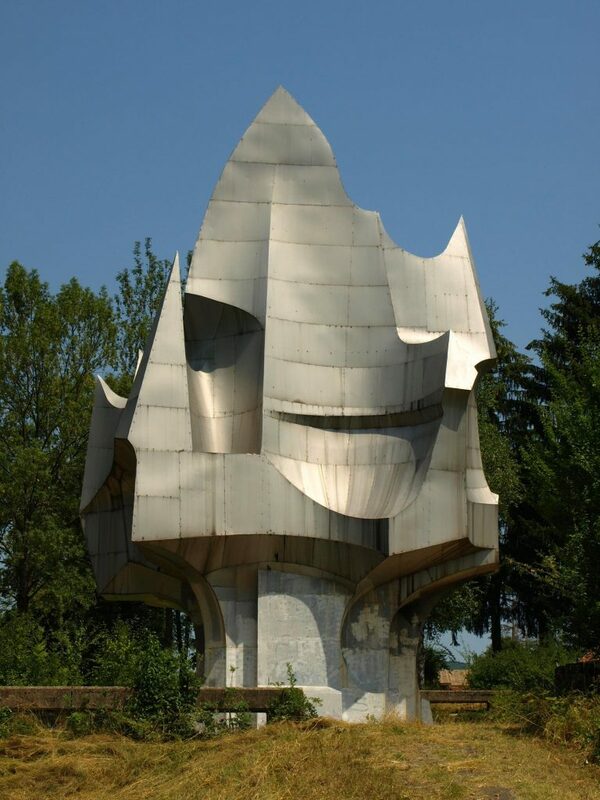 This spomenik made only of stainless steel was designed by Petar Krstić, a famous Bosnian architect. It looks sharp and asymmetrical, and the sunlight reflects off its sides. The idea is that it resembles a burning flame. But what exactly is behind it? 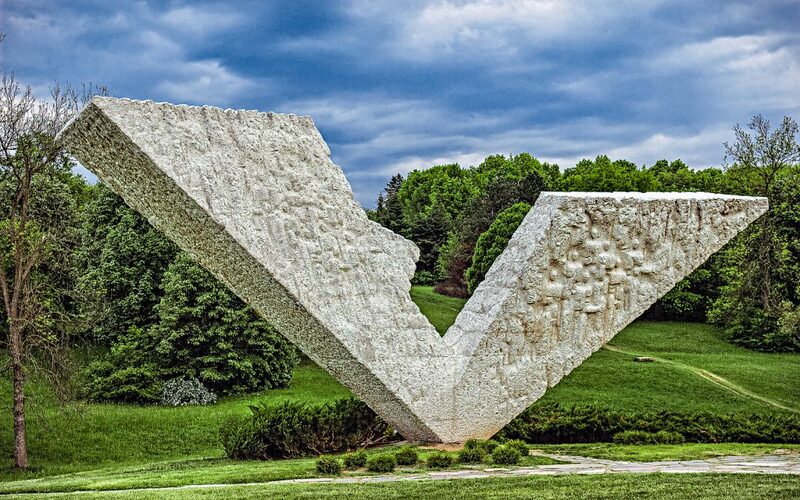 The monument at Sanski Most, Bosnia and Herzegovina, is primarily a memorial to all Axis victims. Also, it commemorates the victims of the “Rebellion of the Sana Peasants”. The Rebellion was the uprising of the local population against the Ustaše oppression. There’s an unconfirmed but popular gruesome story about the building of the monument. Namely, when the workers started digging, blood started bubbling up from the soil. It was determined to be human blood, which probably seeped into the ground and mixed with the moist clay. Symbolically, the flame represents life and light. There were even ideas of installing a sound and light machine to complete the overall experience, but that didn’t happen. However, there are several plaques on it, with useful information and facts.